A Pakistani Christian friend of mine recently travelled to the UK, Ireland and the USA to speak about Pakistan. He visited a number of churches and Christian organisations and spoke about Christian work in Pakistan, highlighting the opportunities for Christians to promote education, healthcare, and community cohesion. He would then pause for questions. In London someone in the audience put their hand up and said “What about Asia Bibi?” – a Pakistani Christian lady who has been on death row in Lahore for several years for allegedly committing blasphemy against the Prophet Mohammed. He was surprised, but answered the question. At his next speaking engagement he did the same presentation, again asked for questions, and again someone in the audience put their hand up and asked about Asia Bibi. This happened in Belfast, Dublin, Oxford, Southall – and then all over again once he got to the USA. The first question that the audience asked was, without fail, about Asia Bibi. Often the only topic that people raised was persecution – and this in spite of the fact that his presentation had been positive, mentioning the positive aspects of life in Pakistan and the many opportunities for Christians to contribute to Pakistani society. 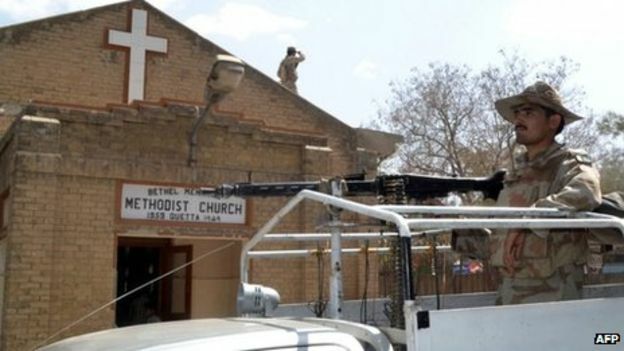 For some reason people in the Western world have got the impression that life for Pakistani Christians is an unrelenting slog of suffering, persecution, oppression, and suicide bombings. Here’s the truth: it isn’t. It really isn’t. Somewhere between 1-2% of the population of Pakistan is Christian. Although that is a small percentage it amounts to several million Christians – not that dissimilar from the number of Christians in modern Britain. And almost all of the time they go about their lives like everyone else in Pakistan: going to work, putting their kids through school, buying food, worrying about rising prices, and drinking tea with their friends and family. Does persecution happen? Yes, of course. Incidents of mob violence and individual harrassment happen every year. Yet we need to put this in perspective: if a few hundred Pakistani Christians suffer persecution each year, it represents a tiny proportion of the whole Christian community. That doesn’t make the incidents of mob violence any less repugnant and heinous – last year a Christian couple were burned alive in a brick kiln, the year before that 118 Christians were killed when two suicide bombers attacked All Saints church in Peshawar – but it puts things into context. Shi’a Muslims, for example, suffer persecution far more frequently than Christians do. We ought to keep calling out for justice for Pakistani minorities who suffer. It is a key human rights issue and a betrayal of the vision for Pakistan that its founder, Mohammed Ali Jinnah, had, when he said that Pakistan would be a refuge for people of all faiths or none. Yet we must also be sure to keep this in perspective, to view isolated incidents in the context of the whole of Pakistan, and to refuse to let fear and anger blind us to the truth. Uh-hu, so we should ignore the ongoing repression, genocide, dhimmitude and forced emigration of Christians by Muslims in the Middle East, North Africa… and indeed all over the Muslim world, in exact accordance with the supremacist Islamic scriptures in the cause of furthering ‘community cohesion’. OK, and good luck preaching the good news in Saudi Arabia, Iraq, Iran, Syria, Pakistan and Bangladesh. Thanks for the comment AJ. In my defence, I never said we should ignore persecution. In fact I specifically said “We ought to keep calling out for justice for Pakistani minorities who suffer. It is a key human rights issue”. I have never said that it should be ignored, and I didn’t mention community cohesion either. It’s not fair to criticise me for things I didn’t say! My main point is that not all Muslims behave in this way – in fact only a tiny minority do. So we shouldn’t let our opinion of Islam be swayed by the actions of a tiny percentage of the whole. Are all Christians represented by Fred Phelps or the KKK? You could see it as a positive commentary on the fact that Christians are concerned to pray for their world-wide brothers and sisters. And those who pray for her will surely pray for others too, and because concerned may actually have a good grasp of the overall situation.